The Penguins dominated the 1st period; San Jose dominated the 2nd. It was Pittsburgh who started to pull away in the 3rd, and a late Nick Bonino goal was able to push them over the top as the Pens took down the Sharks in Game 1 with a 3-2 victory. Also scoring for Pittsburgh were Bryan Rust and Conor Sheary, making it the first time since 1924 that rookies scored the opening two goals in the Stanley Cup Finals, and fellow rookie Matt Murray stopped 24 of 26 San Jose shots to notch the win. Game 1 starteed with the Penguins driving play over the course of the first half of the 1st period until Dainius Zubrus took a high sticking minor against Ian Cole to give the Pens the first power play of the series. would get good pressure on the man advantage, but they wouldn't be able to convert the opportunity. 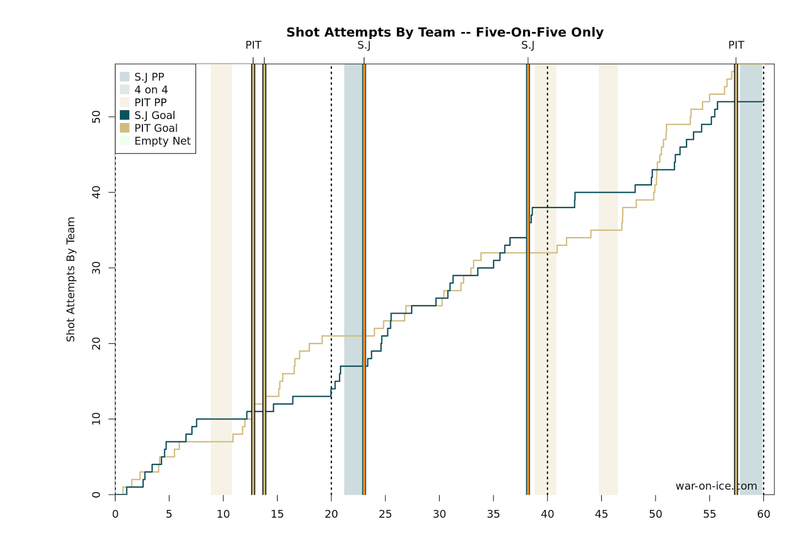 Midway through the period, Pittsburgh would be able to convert the pressure they were generating into a goal. Bryan Rust carried the puck up the ice, dished it off to Justin Schultz, and Rust followed up on Schultz's rebound to slam it behind Martin Jones to make it 1-0 Penguins. It was a great goal to start off the series after threatening to put one in, and it didn't take long for htm to get another. Moments later, Sidney Crosby found Conor Sheary in the right circle from the left boards, and with a Patric Hornqvist screen in front he buried the wrister past Jones to increase the lead to 2-0. And Carl Hagelin would have a chance to blow the roof off CEC on a breakaway, but Brent Burns managed to catch him on the backcheck to poke the puck away. The teams would enter the locker room for the first intermission with the Pens having played about as solid of an opneing 20 minutes as they could have hoped for, but the Sharks flipped the possession advantage in the 2nd period. A Pittsburgh penalty early in the 2nd period put San Jose, clicking at a 27.0% rate during the playoffs, on the power play when Cole was whistled for holding Melker Karlsson entering the Penguins zone. And it would be the Shark man advantage cutting the deficit in half with a hat tip to Olli Maatta, as the Pittsburgh defender deflected a Tomas Hertl pass off Matt Murray's stick and through his five hole to make it 2-1 Penguins. The Pens had a great chance to answer midway through the period. Phil Kessel nearly had a goal on a rebound that popped out to him in the slot midway through the period, but he was stick checked at the last second to prevent the goal. It would end up being a big play for San Jose as they'd tie up the game with under two minutes remaining in the 2nd. Murray would challenge Patrick Marleau at the right post, but Marleau would wrap around the net and beat Murray to the far post as the netminder wasn't able to get out of his butterfly and get across the crease to prevent the tying goal. With 1:09 left in the 2nd period, Joe Pavelski tripped Brian Dumoulin behind the Pittsburgh net to put the Pens back on the powerplay. Pavelski slammed his stick off the ice in disbelief, but replay shows that he clearly got his stick in on Dumoulin's skates. Malkin and Thornton sent off for coincidental minors as well - Malkin for slashing and Thornton for roughing. The teams came out for the 3rd period with the Pens still on the power play, but the Sharks were able to kill the rest of the advantage and get Pavelski back out of the box. Early in the period, Marleau came across the zone and delivered a shot to Rust's head, going off the ice on a check to the head minor that put Pittsburgh back on the power play, but again they couldn't score with the extra skater. Rust would briefly return to skate another shift, but afterwards he would be held out for the rest of the game. 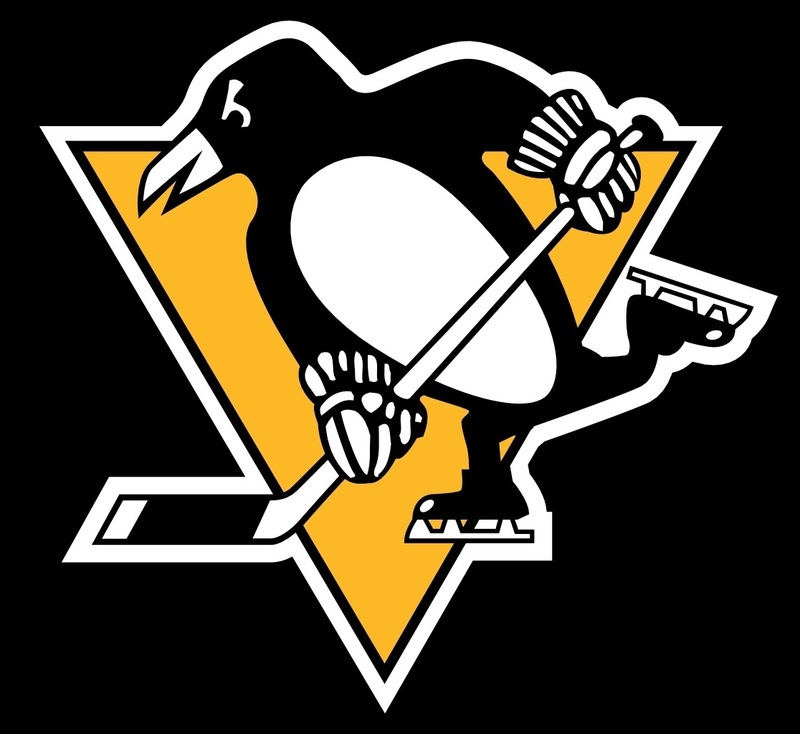 The teams traded long stretches of controlling the play through the first two periods, and it would be the Penguins' turn to drive possession as the 3rd period progressed, and they would have several good chances as they pushed for the go ahead goal. Crosby would feed Hornqvist on a great chance to spring the Swede behind the defense, but Jones would be able to get his pads together to stop the redirect, and he'd recover to get over and stop Crosby's followup shot from the left boards as well. Minutes later, Kris Letang shot the puck off the end boards and had it bounce out to Kessel on the opposite post, but Jones would do a great job getting over to prevent the chance. Late in regulation, it would be the Penguins breaking the deadlock to pull ahead 3-2. Letang would fight for the puck in the right corner behind the San Jose net, taking advantage of Brent Burns without a stick, and he was able to find Nick Bonino on the far post. Bonino settled the puck the snapped it over Jones' right shoulder to allow Pittsburgh to retake the lead. Of course, it wouldn't be easy to close out the game as Ben Lovejoy was given a 2 minute hooking major after mugging Marleau throughout the Pittsburgh defensive zone. The dangerous Shark power play would take the ice, and pulling Jones would give San Jose a 6-on-4 advantage, but they weren't able to force overtime and the Pens took first blood in the series. Pittsburgh would race out to a big possession advantage in the 1st period only to watch it disappeared as the Sharks roared back in the 2nd period with the Pens dialing back the aggression. However, they'd be able to recover in the 3rd period as they mounted enough pressure to eventually get the game winning goal, and the Penguins finished with a score-adjusted 52.6 CF% on the evening. It was further proof that this team needs to keep forcing the issue and attacking the other team's zone, even with a lead. The teams will be back at it Wednesday night for Game 2, and Pittsburgh will attempt to take a 2-0 lead as the series shifts back to San Jose.